Title card to the 1951 screen version. 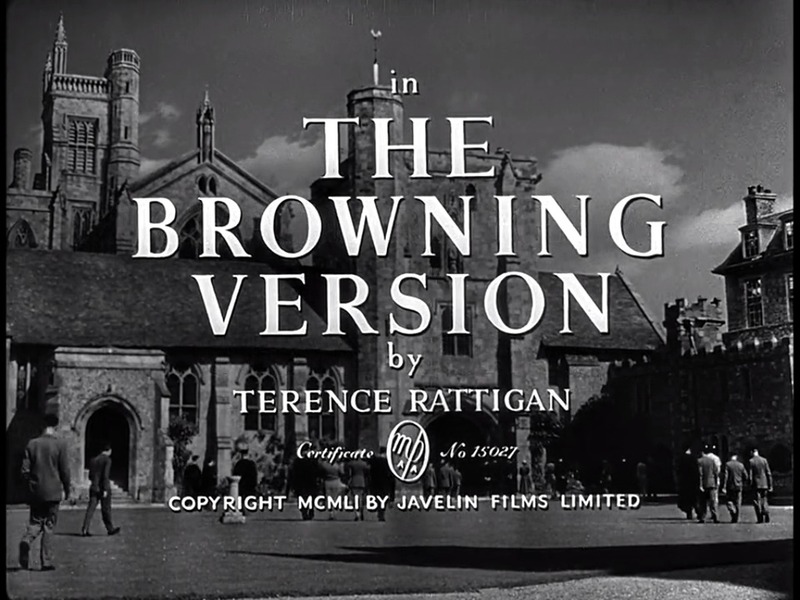 In the 1951 screen adaptation of Terence Rattigan’s one act play, “The Browning Version,” Michael Redgrave gives what I consider to be perhaps the greatest screen performance by a leading actor. At any rate, I cannot think of a performance that I admire more. (There is one performance by an actress that I think is as great, but I’ll discuss that in another post.) By no means is “The Browning Version” a perfect movie — it’s full of bad performances (Jean Kent as his shrewish wife is especially appalling), and it suffers from a ludicrous final scene that was added to give the story a squishy uplift that undermines the story’s tragic integrity. But Michael Redgrave’s performance as Mr Crocker-Harris, a much despised schoolmaster, is beyond reproach. Here’s a scene in which he gives a private tutorial to his one sympathetic student, named Taplow (Brian Smith). In 1985, Ian Holm played the role on the BBC. He was supported by a much better cast (including Judi Dench in the Jean Kent role: Dame Judi proves the role does work when handled with sensitivity and intelligence). Holm’s own performance is excellent — and different in nearly every conceivable way from Redgrave’s. (Taplow is very well played by Steven Mackintosh.) Have a look. I have great admiration for Holm’s performance; in some ways, I think he may be closer to Rattigan’s original conception. The constriction in his throat, for example, strikes me as a good acting choice: Mr Crocker-Harris is being forced to leave his position due to illness; Holm’s habitual clearing of his throat suggests both some sort of chronic illness, as well as chronic psychological discomfort. By contrast, Redgrave gives no indication of the nature of Mr Crocker-Harris’ career-ending illness. But as admirable and tough-minded as Holm’s interpretation is, he doesn’t move me as deeply as Redgrave does. At first, I thought it possible that I was simply more familiar with Redgrave’s performance. But I’ve changed my mind about this. In fairness to Holm, I should mention that the director, Michael A. Simpson, has done him no favors by shooting the scene entirely in close-ups, which interferes with the possibility of establishing any chemistry between him and Taplow. In Anthony Asquith’s movie, the scene is played largely with both characters in the shot, which makes the Crock’s reactions to Taplow’s remarks more immediate and pathetic. Also, it’s well to remember that Michael Redgrave was a very large man — six foot five — so having him in the same shot with Brian Smith allows him to loom in a way that the diminutive Ian Holm cannot. In this next scene, the Crock explains at some length how he developed into the eccentric person he has become. The picture must have attracted very little attention in the United States when it was released, otherwise I cannot understand how a performance like this could fail to be nominated for an Academy Award. Redgrave did, however, win the prize that year at the Cannes Film Festival. When Holm speaks of his wish to “communicate, however imperfectly, some of my joy in the great literature of the past,” the effect is more ironic than poignant: he’s so stern, so robotic that the joy he speaks of is hard, even impossible, to imagine. When Redgrave speaks the lines, you can plainly hear from the way he caresses the words that his feelings for literature run very deep. There is nothing at all dusty about his love; his tragedy is his not possessing “the knack of making [himself] liked.” As I see it, it is not the Crock’s implacability or coldness that made him disliked when he was first starting out as a schoolmaster, but rather the intensity of his passion for his subject. It is this passion that he slowly developed into parody for the boys’ amusement, “because you can teach far more things by laughter than by earnestness.” His observations about “my little mannerisms and tricks of speech” make far more sense if he actually has mannerisms and tricks of speech, which Holm does not — at least, not in abundance. Moreover, an important plot device turns upon Mrs Crocker-Harris’ catching Taplow in the middle of doing an impersonation of her husband. Redgrave’s performance provides a vast inventory of vocal tics for Taplow to imitate; Ian Holm gives the poor boy little to imitate, other than an habitual clearing of the throat and a permanent scowl. It also appears that Holm takes too literally the Crock’s claim that “I have so little sense of humour.” Mr Crocker-Harris never stops making little jokes, but they’re either so abstruse that nobody gets them or they’re so caustic that nobody finds them amusing. He knows nobody will laugh, but he makes the jokes anyway, then follows them with an icy little smirk. His wit isolates him. When Taplow takes pity on him in class, and laughs at one of his little epigrams (which Taplow later describes as a “dud joke”), the Crock calls him to the front of the class and demands that the boy explain it to the rest of the class. Eventually Taplow confesses that he didn’t hear it properly. “Then why did you laugh at what you did not hear?” “Politeness.” The Crock mumurs, “Toujours la politesse” and sends him back to his seat, with a scornful, “If you should really wish to show me politeness, you will do so by composing verses less appalling than the ones I corrected this morning.” In the picture, this scene is our introduction to the Crock (in the play, we only get the story in Taplow’s recounting of it), and it presents an indelible picture of a harsh master who makes jokes with the specific intention of bewildering his students and then humiliates anyone who has the effrontery to laugh politely. Crocker-Harris has a highly developed sense of humor; he just isn’t prepared to have his punchlines induce laughter. I’m afraid I’ve come down too hard on Ian Holm in my effort to make clear what I love so much about Redgrave’s gorgeous performance. Holm’s performance is entirely valid and emotionally satisfying. Taken as a whole, the 1985 BBC production is better than the 1951 picture. But as fine as Holm is, the performance isn’t monumental in the way that Redgrave’s is. Happily, you can see both the 1951 and the 1985 versions in their entirety on YouTube, though of course YouTube is never the best way to see anything. You can also see the surprisingly ill-conceived 1994 Mike Figgis picture starring Albert Finney and Greta Scacchi on YouTube (which actually may be the one time when YouTube is the best way to see a picture: in the movie theatre, I found Figgis’ remake intolerable). I say “surprisingly ill-conceived,” because on the Criterion Collection’s excellent DVD transfer of the 1951 picture, Figgis talks brilliantly about the play and the style of acting that was still in vogue when it was written. Figgis is so perceptive and lucid about the material and the out-of-date acting style that I was bewildered that he could have made so many mistakes when he got the chance to do his own version of a play he understands so completely. Finney is a superb actor, but it’s hard to imagine an actor less suited temperamentally to the character of poor old Mr Crocker-Harris. I found myself peeking through my fingers at the picture. This entry was posted in Main and tagged Agamemnon, Brian Smith, Crocker-Harris, Ian Holm Judi Dench, Jean Kent, Mike Figgis, Steven Mackintosh, Terence Rattigan, The Browning Version on July 2, 2013 by TR. It came out nicely indeed. I love the nice balance you found between the comparisons and the detailed description of his performance. Nice article. Any thoughts on the Albert Finney version? Amazing review and I completely, utterly agree with every single point made. I am amused by “YouTube is the best version” with regard to the 1994 version. It’s a real joy to watch Redgrave’ s performance in the two scenes. Not to mention that the picture quality is satisfactory.